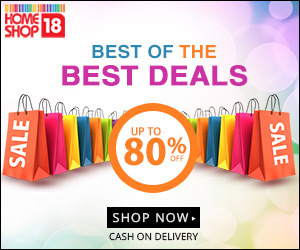 HomeShop18 is one of the leasing online home shopping websites in India. HomeShop18 has come up with lot of offers and promo codes today for this October 2015. Discount - Flat 10% OFF on Fashion, Footwear, Accessories, Clothes. Discount - Flat 8% Off on Home & Kitchen items. Discount - Flat 12% Off on Jewellery items. Discount - Flat 12% Off on Health and Beauty items.